In late May Father Dan Kredensor, a theology teacher at Archbishop Carroll High School in Radnor for the past two years, started planning activities with students on the ministry team for the upcoming school year. It’s been said that when you make plans, God laughs. This certainly seems to have happened with Father Kredensor, 32, who is now the youngest priest to be named a pastor in the Archdiocese of Philadelphia. On July 1 he began serving as pastor of the recently merged St. Ignatius and Our Mother of Sorrows Parishes in West Philadelphia. He said the vision of Archbishop Charles Chaput is to re-evangelize the inner city, and he wanted to place a young priest who was interested in ministering there. “He wants priests in different ministries that will fit their interests, and age is not a barrier to him,” Father Kredensor said. His interest in ministering to Black Catholics goes back to his apostolate experiences at St. Charles Borromeo Seminary. During that time his uncle, Father Thomas McGann, was pastor of two parishes in the city of Kingston, Jamaica, so one summer Father Kredensor worked there with medical mission groups, AIDS houses for children and the youth of the parishes. As a seminarian Father Kredensor also had the opportunity to serve at St. Martin de Porres Parish in North Philadelphia with Father Edward Hallinan, who was pastor of St. Martin’s for 14 years. 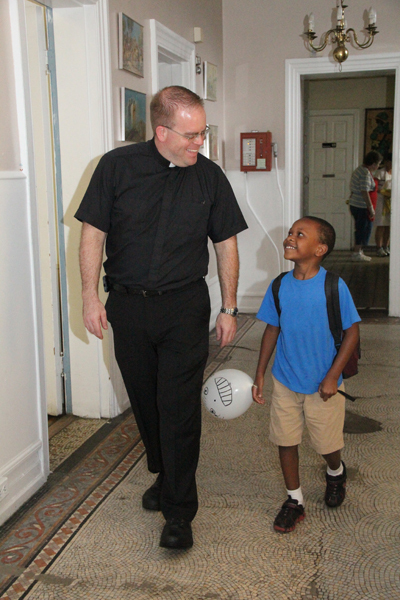 Father Kredensor walks with St. Ignatius parishioner Derrick Gray. While Father Kredensor will be the youngest pastor, he won’t need to figure out this new role by himself. During his meeting with Msgr. Daniel Sullivan, vicar for clergy, Father Kredensor was assured that he would receive the support he needed. “He said, ‘We want you to be a pastor, and we’re going to give you a mentor. We’re going to be with you every step of the way,’” Father Kredensor said. 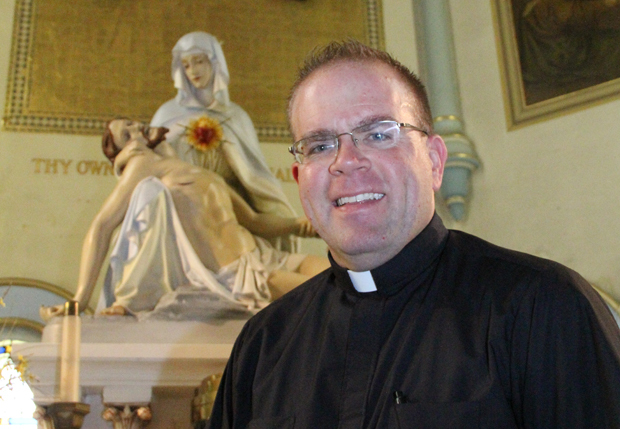 Filling that mentor role will be Father Henry McKee, pastor of Sacred Heart Parish in Havertown. Father Kredensor has been in residence at Sacred Heart for the past year, and Father McKee has been a pastor for 23 years, including 10 years as a pastor in the city. Father Kredensor’s job as pastor of St. Ignatius will be somewhat easier because his predecessor, Father Jeffrey Stecz, has a transition team in place and he handled the merger of the parishes which happened in January. “Father Jeff was given a very hard task to do, and I’m grateful to him that part is done,” he said. Father Stecz was subsequently named pastor of St. Agnes Parish in Sellersville. 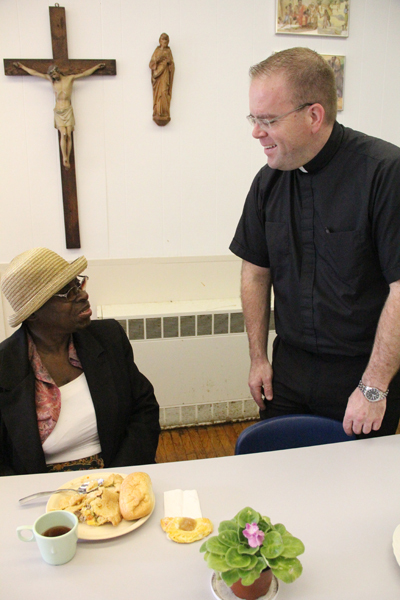 Our Mother of Sorrows continues to host a community outreach program that feeds about 150 people Monday through Wednesday each week, one of whom is local resident Susie, chatting over lunch with Father Kredensor. As Father Kredensor begins his pastorship he knows a top priority will be the ongoing healing process after the merger. “If we’re not unified as a parish I don’t think our ability to evangelize out into the neighborhood will happen,” he said. In addition to meeting the spiritual needs of the people, some initial challenges include hiring staff members and figuring out how the parish buildings will be used. Our Mother of Sorrows Church has been designated as a worship site. Another recent change is that Our Mother of Sorrows and St.IgnatiusSchoolwas designated as a mission school and will be overseen by the Independence Mission Schools organization. “It’s going to be a learning curve for every part of the parish and the pastor too,” Father Kredensor said. While there will be challenges, the new pastor knows there are many positive things happening at St. Ignatius, which he said is a strong faith community with deep roots in the area. Father Kredensor also noted there is an active youth group and Legion of Mary as well as vital outreach ministries happening at St. Ignatius and Our Mother of Sorrows. “Keeping the outreach open at Our Mother of Sorrows is going to be one of the blessings of the parish because people from around the diocese come to help down there, bring food and pack the food,” he said. Father Kredensor is excited about the future of the parish and is eager to work with parishioners to find new ways to serve and evangelize their West Philadelphia neighborhood. “I’m really looking forward to walking with the people of St. Ignatius and walking in that journey of faith with them,” he said. Many volunteers, including youth groups and students from local colleges, assist St. Ignatius Parish with a variety of projects. Father Kredensor welcomes volunteers and anyone who can donate in-kind gifts (appliances, furniture, building supplies) or services (plumbing, carpentry, painting). Financial donations are also appreciated. For more information on how to assist the parish, send an e-mail to Father Kredensor at fr.kredensor@gmail.com. Elena Perri is a freelance writer in Havertown. Congratulations, Father Kredensor, you have a great role model in Archbishop Chaput to help make your ministry a worthy and spiritual experience. God bless.